Getting there: Located on the south side of Houghton from US 41, turn at the light on MacInnes Drive. Follow MacInnes Drive to Sharon Avenue and the Student Development Complex (SDC). Take Sharon avenue past the SDC to the access road for IMR storage. Turn left to park. 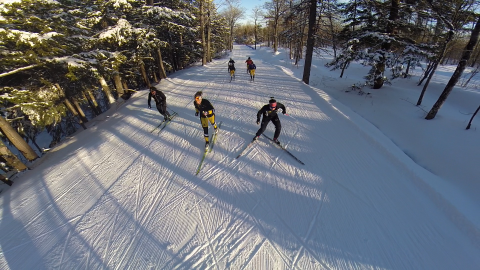 Michigan Tech’s cross country ski trail system, located right across the street from the Student Development Complex, includes 35 kilometers of the best skiing in the Midwest. Grooming takes place daily and the system includes 7.5 kilometers of lighted trails, making an after-class outing a breeze for students. The Tech Trails are nationally recognized for the quality or skiing, consistency of grooming and variety of terrain. The trail system, with the help of hundreds of volunteers, hosted the US Junior National Championships, and U.S.Senior National championships, along with regional races. With Houghton’s average snowfall approaching 250 inches, the season usually opens in early December and continues into April. Students ski free; community members can purchase a reasonably priced pass.